On Thursday, the House finally reauthorized the Violence Against Women Act (VAWA) after waiting for around a year-and-a-half. Finally. The bill was originally passed in 1994 and has been re-approved twice since in 2000 and 2005. What is different about this time? Because three new specifics have been added which include protection for Native Americans, members of the LGBT community, and undocumented immigrants. The bill offers protections for gay, bisexual or transgender victims of domestic abuse, which is self-explanatory. Additionally, the bill provides protection for Native American women who are assaulted on reservations by non-natives to take their case to tribal courts, which otherwise would not have jurisdiction over assailants who do not live on tribal land. Approximately 40% of Indigenous women are abused at some point in their life, with a significant percentage from men who are not Native American. Thus the women’s tribal lands were unable to prosecute their abuser. Lastly, the VAWA re-authorization also provides more access to services for immigrant victims of violence, and helps them obtain special visas to stay in the US if they are victims of a serious crime. There were 160 Republicans and 0 Democrats – although one did abstain – that voted against the revised VAWA. The oppostion from the Republican Party is of no surprise. They are still fighting to remain a white, anti-gay, male-dominant party and US power, even after the 2012 election results proved that this country no longer is a white, anti-gay, male-dominant party nor majority of citizens. No surprise. What really bothers me the most is that this selfish bigots were willing so “sacrifice” those women who have previously been under the protection of VAWA. The politicians who voted against the protection act were more concerned about their own beliefs than they were in protecting the women – and now men – of the country they were elected to serve… not dictate. Want to know who in your state wanted to dictate who can and cannot be protected under the Violence Against Women Act? Here are all 160 members of this now infamous group. FYI… Surprisingly, WI Rep. Paul Ryan (R) voted yes. Ryan had previously stated he supported leaving the decisions up to the states. Sadly, Michele Bachmann voted “no.” She is so anti-gay that she would cut off her nose to spite her face – as well as pull such an important bill for all women just because of her personal ignorance. There were a few other women, too. Breaks my heart. Mother Jones: MAPS: Did Your Congressmember Vote Against The Violence Against Women Act? Especially if it was a woman who voted no. Truly sad, those 160 should be fired for being the idiots they are! Good post. I hope the people of their states realize how they voted and in turn, vote them out. Thanks for explaining about Native American women. I was wondering why being a woman wasn’t enough to be covered under the Violence Against Women Act. I’m still just totally dumbfounded that anyone, much less a woman, could find any reason whatsoever to vote against this bill. I hear ya. I didn’t think it was possible to loath Bachmann any more than I already do, but I was wrong. It is possible. Good post. I also discussed the vote for the Violence Against Women Act. I wonder how the ones who voted went home and faced their wives and daughters, sisters and mothers. I hope you don’t mind I am going to reblog this. Everyone needs to know if any of the no votes comes from their state Congress person. I hadn’t thought about that, but you’re absolutely right. How can any of these haters hurt their own women family members and friends. And, please. You are more than welcome to reblog. What I wonder is how the Congress people who voted no went (ran) home today and faced their wives, girlfriends, sisters, mothers. I just don’t get it. 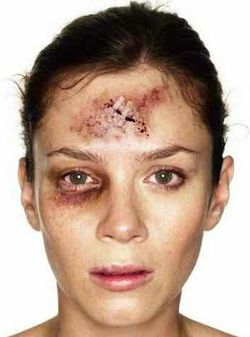 Getting beaten is just as painful to an immigrant, a Native American or an LGBT as it is to any other woman. These males who voted against it are not men. As for the women who did…I just don’t know WHAT they are! You’re not kidding there. They’ve been bought is about the only thing I can think of. Or have so much hate in their hearts, they’ll do anything anti-Democratic, anti-Obama, anti-liberal, and so on. Pitiful lot they are. TeaTardedRepubliCANTS make me sick to my stomach. Shameful indeed that so many voted against it.. Why?? It’s unfathomable.. I know. And they keep getting reelected. I find it hard to believe that women actually voted against this bill, it just doesn’t make sense. I recently learned that Native American women are victims to an incredible amount of abuse and I was shocked by the numbers. Louise Erdrich’s National Book Award Winner “The Round House” has this being a central element of its plot. As for the Republicans…I’m not shocked. Unless they wake up they will be relegated to history’s dustbin. Yes, they are. I didn’t realize how much until I moved down here. Have you heard that today ( Friday ) Repubs are taking credit for voting for VAWA, now that it’s passed. They probably voted for their own watered down version so that they can have it both ways. Doesn’t surprise me. Bunch of losers.